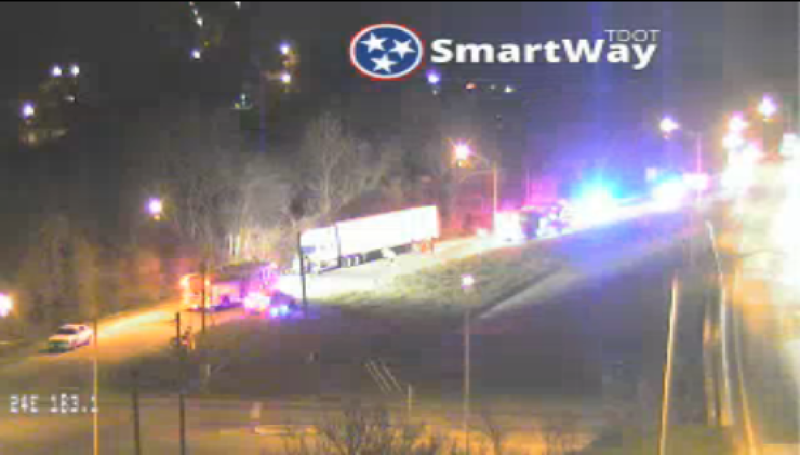 This screenshot taken from the Tennessee Department of Transportation's SmartWay website shows a semitractor-trailer on the side of I-24 eastbound that caught fire and slowed traffic. A cargo fire onboard a semi tractor-trailer has affected eastbound traffic on Interstate 24 at the Belvoir Avenue/Germantown Road exit 183A, according to the Tennessee Department of Transportation. The fire was first reported at 8:41 p.m. and is estimated to be cleared by 11:42 p.m. Thursday night. TDOT's SmartWay website currently shows the truck on the side of the road surrounded by fire and police vehicles. The off-ramp is also blocked. Westbound traffic is not affected, according to TDOT.